Bree was the first pup Lily gave birth to and she had her in my lap! From that moment on, she had my heart. Although much nicer conformation, she is very much like Lil in temperament. 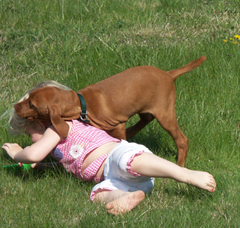 While I took pride in the accomplishments of Lily and Cali, there is nothing like doing well with a dog you have bred. Mostly owner handled, she finished her Conformation Championship in April at 13 months. In the more than capable hands of Liz Outram, Bree earned her Field Dog Junior title in 3 straight tries, moving directly to the Field Dog testing. 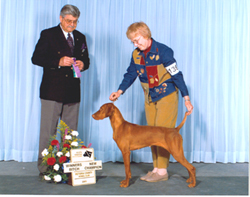 Earning her 3 qualifying legs in 5 attempts, she finished herField Dog title in style by earning the Highest Qualifying Score at the Vizsla Canada test for her 3rd leg - at only 15 months of age! 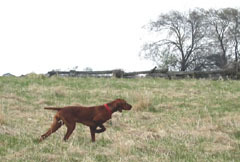 Between field tests, Liz ran her in NAVDHA Natural Ability spring test. 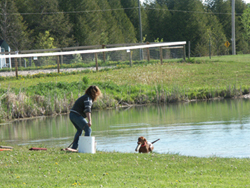 The first part of this test involves the dog swimming twice, not usually a problem for Bree. She went in with great enthusiasm the first time, but refused the second attempt, scooting off to do her business as nature called. The rules of this test requires a dog must swim twice, so Bree was given a second chance when all other dogs had finished. She gleefully entered the water to retrieve the dead bird that had been thrown for her. This gave her an automatic 5 out of 10 in this part. 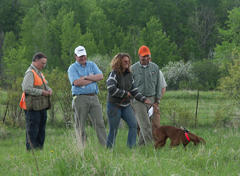 When she entered the bird field in the second portion of the test, I overheard someone commenting "this dog is all show - there will be no hunt in her". As Bree announced her first bird by slamming on point, the comment was quickly revised to "Boy, that saved her bacon from this morning". In the tracking portion of the test, she found her pheasant without any trouble, retrieving it to hand ---- whoops, past Liz into the hand of a judge (trying to pick up brownie points for her water episode.) After losing 10 points on her water retrieve, Bree came in with a 93, Prize 111.